Torneo Clausura 2010: ¡Argentinos Campeón! HEGS‘ first championship finale based in Argentina has been an eventful one. 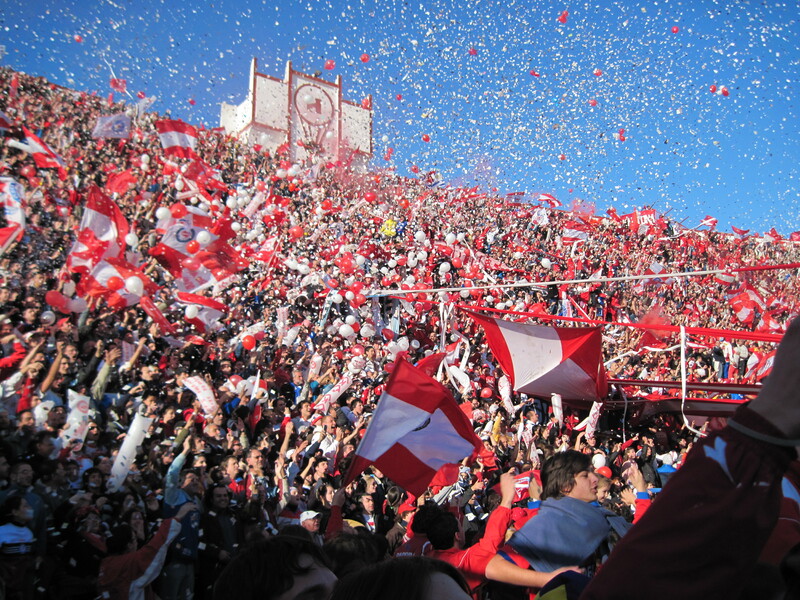 25 years after their second and last domestic title, and one week after that astonishing comeback from the dead against Independiente, Argentinos Juniors beat Huracán 2-1 away to seal their place as champions of the Bicentennial Torneo Clausura 2010. Goals from Juan Mercier and Facundo Coria gave El Bicho enough of a cushion that Alan Sánchez’s 88th minute consolation for the hosts didn’t matter. HEGS was there, and for once the home fans got out early as the away contingent celebrated long and hard. Estudiantes won 4-1 away against Colón, but to no avail. It’s been a see-saw championship – if the see-saw in question has at least five seats on a central pivot – and after all matches have been played it’s the side from La Paternal who’ve come out on top. Whether we got in entirely legally or not, Johnny and I still aren’t totally sure – an Argentinos fan and his girlfriend got us through the security checks and took us into the stadium on their members’ cards without us ever seeing a ticket – but after the experience of last Sunday we couldn’t miss out on seeing Argentinos’ coronation, especially since Huracán’s ground is practically down the road from where we both live in San Telmo. We watched the first half from almost right behind the goal and then, after having made out very little of it, moved to a more elevated spot behind the corner flag for the second period (at which point, annoyingly, my camera gave out – the photo above is from when the teams took to the pitch). The first half was largely Argentinos’, and they might have already had the lead before Mercier’s header from a corner in the 23rd minute, were it not for Gastón Monzón in the home goal. After Mercier scored though, there was no hint of the nerves that affected the side last Sunday, as they continued to press forward whilst staying solid at the back. Celebrations started when Facundo Coria – who missed last Sunday’s historic comeback – doubled the lead with just under 15 minutes to play, and although Sánchez struck a decent goal to pull the deficit back to 2-1 the final score was never in doubt. A few idiots in the Huracán popular set fire to something after the match, whilst a large minority in the plateas stayed behind to applaud the visitors who were awarded the trophy on the pitch afterwards. For Estudiantes, who had to win and hope Argentinos didn’t, Mauro Boselli had a hat trick by the time the second half was five minutes old to make a mockery of Colón’s reputation for beating big teams in their own back yard. Enzo Pérez then added a fourth and although Facundo Curuchet got one for Colón in the 76th minute, it wasn’t enough for Colón – just as Estudiantes’ impressive win wasn’t enough to give them the title. You can follow the Clausura and the Argentine sides in the 2010 Copa Libertadores via HEGS on Twitter (including updates during and between matches and similar stories that might not go up on the site until later). If you’ve not signed up yet you can do so here. Legal or not, for sure, but whatever works. After witnessing the last two wonderful Argentinos’ matches, Palermo’s last second winner against Peru, and some other exciting matches, my friend Bostero Forever is now referring to me as Forrest Gump. Johnny, for the Sacred Bombonera! You’re living your life through Argentine futbol like Tom Hanks did it through American History. Every Big local event counted with your presence then and there to witness it! And most of the times with a fvorable ending. So, that’s why I propose here and now a big national colect to purchase you the passage and tickets to watch Maradona’s team in each stadium he’ll play!! Ha Ha ! Thanks friend Bostero Forever ! I would be glad to take my talismanic effect to South Africa ! Incidentally, BF (and anyone else), as proof that Johnny and I did indeed meet Argentinos Juniors president Luis Segura last week after the Independiente match, the photo is now on Flickr, and I’ll be using it and a few others a little later in the week here on HEGS. You two look like ready to join the game anymoment! the argentine delegation to Southafrica should keep Johnny as a token of gook luck, and sit him on the bench besides Martin Palermo! How on earth did you end up on the subs’ bench? It is to say the least a long story, Johan, and it’ll be covered on these pages a little later in the week as part of a short piece about mine and Johnny’s trip to see Argentina’s (then) champions elect. Keep your eyes on HEGS!